CZECH REPUBLIC – Best of Bohemia and Moravia with Krumlov Medieval Festival! Posted in: Czech Republic, Europe. The best of Bohemia & Moravia tour is a well-rounded exploration of the country, its people, culture, and nature. Tour well-preserved architecture of all periods, magnificent interiors, including the UNESCO-protected towns of Cesky Krumlov and Telc, and the Lednice-Valtice cultural landscape, known as the “Garden of Europe”. This is the most comprehensive tour, offering the widest scope of the best that Czech Republic has to offer. Tour includes travel along the Czech Greenways while enjoying 6 UNESCO World Heritage Sites. It packs a wide range of interests, including architecture, nature, history, Jewish heritage, traditional arts and crafts, and personal encounters with ordinary people. 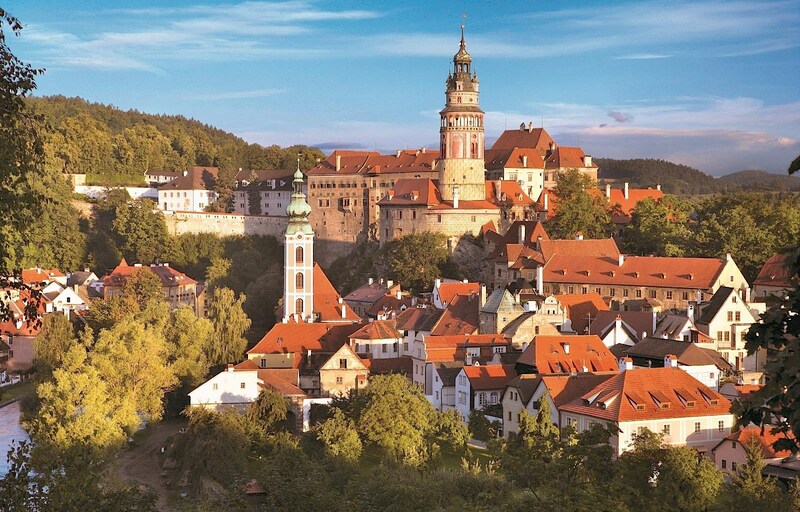 The tour is scheduled to coincide with the Medieval festival held over 3 days in Cesky Krumlov that includes a spectacular procession in historical costumes featuring knights on horseback and many notables linked with the history of the town. Vienna is considered by many as one of the most charming cities in Europe. Full a sightseeing tour to explore the city’s most wonderful sights. View the impressive buildings of the Ringstrasse including the State Opera, the Burgtheater and Hofburg and the wonderful home of the Habsburgs. Afternoon visit to the magnificent Schonnbrunn Castle, summer palace of the Habsburgs with its spectacular rooms. At the end of the day transfer to Mikulov, Czech Republic, which was for centuries the most important cultural and administrative center of Moravian Jews. Tour of Mikulov, its square with its graffito houses, the crypt of the Dietriechstein family, as well as the synagogue and Jewish Cemetery, where the oldest tombstones date back to 1605. The program will then concentrate on the unique Lednice-Valtice area, a UNESCO World Heritage Site, the former estate of the Liechtenstein family which resided there from early 13th century until 1945. The area is graced by two magnificent chateaux and numerous “follies”, romantic structures set in a harmonious way into the surrounding landscape. Vineyards on the slopes of mellow hills, mirror-smooth ponds, nature reserves, bird sanctuaries, storks’ nests perched up on high trees – all these, plus excellent cooking and wine are among the simple pleasures of life in South Moravia. Do not neglect to walk through the chateau’s wonderful gardens. We will also drive through the beautiful lime-rock Palava Hills and visit the historic wine-growing village of Pavlov. Early morning drive to the small village of Vranov nad Dyji with its unique view of the chateau on a rock spur over the river. We stat the day with the tour of the magnificent Baroque chateau in Vranov, standing on the site of a 12th century castle which was never conquered and today offers an intriguing view of the surroundings area and an exposition of ceramics in style similar to that of Wedgwood from the local manufacturers. After the tour drive a short distance to the nearby Bitov castle, mirroring in the waters of the Vranov reservoir; then drive over to Cizov where you can see the last remains of the “Iron Curtain”. We continue the drive through the country to the the Moravian Renaissance town of Telc, architectural and artistic gem, unchanged by time and designated by UNESCO as a World Heritag site. We enjoy our morning on the spacious square of Telc, encircled with Renaissance gables and arcades, a UNESCO World Heritage Site. We visit the Renaissance Chateau before continuing via Dacice and Slavonice to the nearby village of Mariz, located in the former no-man’s land on the Austrian border. We visit the nearby castle at Landstejn before taking a train ride on the curious narrow-gauge railway to Jindrichuv Hradec, yet another memorable town, situated on the banks of the river Nezarka. The advanced cultural level of the town is evident with the fact that its newspaper of 1495 is the oldest hand-written newspaper in the Czech language. The superb Renaissance chateau of the Rozmberks and the famous Bohemian tapestry centers are noteworthy and a joy to behold. This morning, take in the historic town and castle of Jindrichuv Hradec. After the visit, continue through the mosaic of ponds, woods and meadows of the Bohemian Lake District via Cervena Lhota,arguably the most fairy-like of Bohemia’s castles and Straz nad Nezarkou, home of the Metropolitan Opera singer Ema Destinnova. The tour ends in Trebon, a medieval city established back in the 13th century; parts of the early 16th-century fortifications have been preserved to this day. One can enter the charming town by any of the three historical gates, and enter into yesteryear. This morning we have free time to explore the town bore driving to the picturesque town of Cesky Krumlov, situated on the banks of the meandering upper course of the Vltava river. Today the Five Petalled Rose celebrations begin. A three day event that celebrates the spirit of the Renaissance age with the hubbub of jousts, craft fairs, medieval music, street plays, and fencing duels to culminate with the highlight of the festival – a spectacular procession in historical costumes featuring knights on horseback and many notables linked with the history of the town. Cesky Krumlov, the jewel of South Bohemia is a UNESCO World Heritage Site, universally recognized as a unique remnant of historic urbanism. The old town preserves, virtually intact and still vital, an unparalleled ensemble of Gothic, Renaissance and Baroque structures. Among the attractions is the second largest castle complex in the Czech Republic, the oldest working Baroque theatre in Europe and an open-air theatre with a revolving auditorium. We are able to enjoy the second day of the festival celebrating with the local population. Today we leave Cesky Krumlov and drive to Krasetin to take a cable car to the top of Klet, highest peak in the region with great vistas. Your next stop is the fairy-tale Tudor Gothic chateau of Hluboka, the best known and most visited castle in the Czech Republic. Continue on to Tabor for a tour of this historically important town founded by the Hussites in 1420 and was named after the biblical Mount Tabor. Your final destination today will be Prague, the magical city of a hundred spires built on the banks of the meandering Vltava river, with one of Europe’s most elegant castles overlooking this ancient, beautiful city. Morning tour of the glorious sights of this very beautiful European city, followed by a walk through the Old Town. Visit the main Square, the Town Hall and the Jewish Quarter. Afternoon free. Tonight, enjoy a farewell dinner in Prague. After breakfast, transfer to Prague’s airport to board your homebound flight. The Czech Greenways is a newly-designated corridor of 100-year-old hiking trails stretching for 250 miles from Vienna to Prague along the Dyje River in Southern Moravia and the Vltava River Valley in Southern and Central Bohemia. It connects beautiful countryside with cultural monuments, historic towns and villages with restored castles and churches. Since much of the Czech Greenways stretches along the former Iron Curtain, where there was limited access and no development for 45 years, the countryside remained untouched and the environment clean.